Ford's compact gets EcoBoost engines, customizable drive modes, and new eight-speed automatic transmission. It's been a long time coming. 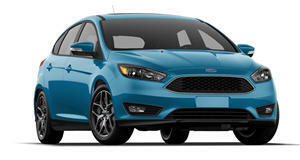 Ford has finally revealed every angle of the new Ford Focus, which will be returning to North America in the second half of 2019 as a 2020 model. Replacing the third-generation Focus, which debuted as a 2011 model in the U.S., the all-new fourth-generation Focus will arrive on our shores with EcoBoost engines, a new eight-speed automatic transmission to replace the derided six-speed PowerShift dual-clutch automatic, and drive modes similar to those in the . Ford detailed many of the mechanical, bodystyle, and trim options that it will make available on the Focus for European and Chinese markets on Tuesday, including body styles ranging from a four-door sedan, a five-door hatch, a wagon, and an all-new Active with a jacked up the suspension and plastic body cladding all the way around that could come here. An assortment of 1.0- and 1.5-liter EcoBoost gas engines will be available in both China and Europe, though the Old Continent will also see a new 2.0-liter EcoBlue diesel engine to replace the outgoing DuraTorq. Don't expect the oil burner to come here, but there's a good chance the 1.5-liter EcoBoost could replace the Focus' 2.0-liter base engine in the U.S.
Those engines will send power to the front wheels via an eight-speed automatic transmission, likely the same gearbox co-developed with General Motors for front-wheel-drive applications. It's also used in the redesigned Ford Edge. Adaptive Shift Scheduling and Adaptive Shift Quality Control make the transmission smoother and more responsive, while the new transmission allows the Focus to get Drive Modes for the first time ever. Three modes are available - Normal, Sport and Eco - which adjust engine response, transmission mapping, steering feel, and Adaptive Cruise Control. 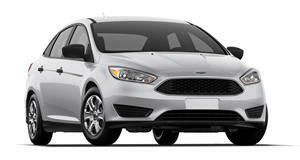 Underneath the Focus' new body work is a brand-new chassis that Ford claims is 20-percent more rigid than before. That new chassis provides the basis for a redesigned suspension, though Ford didn't provide details on its configuration. Inside, Focus has been gifted an all-new interior that places an 8-inch touchscreen with pinch-and-swipe functionality front and center. It runs SYNC 3 and supports Apple CarPlay and Android Auto. A new B&O Play audio system has also been added to the infotainment lineup. The center console has been redesigned with an electronic parking brake and new rotary-style shifter, allowing space for a new wireless charging pad will make sure the music doesn't stop. An included WiFi hotspot can support up to 10 connected devices at any given time. Connectivity isn't just limited to inside the car. The FordPass mobile app will give owners the ability to locate their vehicle in large parking lots; check on vehicle vitals, including fuel level, alarm status, and oil life; remotely start the car from greater distances; and to lock/unlock the doors with your phone. The Ford Focus will make land in the U.S. next year, a full year after launching in Europe and China, and will come with Ford's new Co-Pilot 360 suite of safety technology. Expect an ST version and possibly another RS model to arrive well after that.